With The Loop kicking goals every Saturday morning on ELEVEN, and the third series of Prank Patrol launching on ABC3 this Sunday, April Fools Day at 2.10PM, Scott Tweedie is again set to light up our television screens with his affable charm and personality. Not one to rest on his laurels, since his move to Sydney Scott has been in demand as an MC and host, and is making a very good impression. Dressed in a Vanguard Denim Shirt and Neuw Denim Jeans (above) Scott walked the Black Carpet at Tropfest, after hosting the Trop Jr Short Film Festival earlier that day. Scott could then be found hosting the main stage at the Target Kids Day Out. Dressed in a Folke T, Neuw Denim chinos, Gideon shows and rocking an O Clock watch, Scott is pictured here hanging backstage with Yo Gabba Gabba and Rob Mills from Young Talent Time. 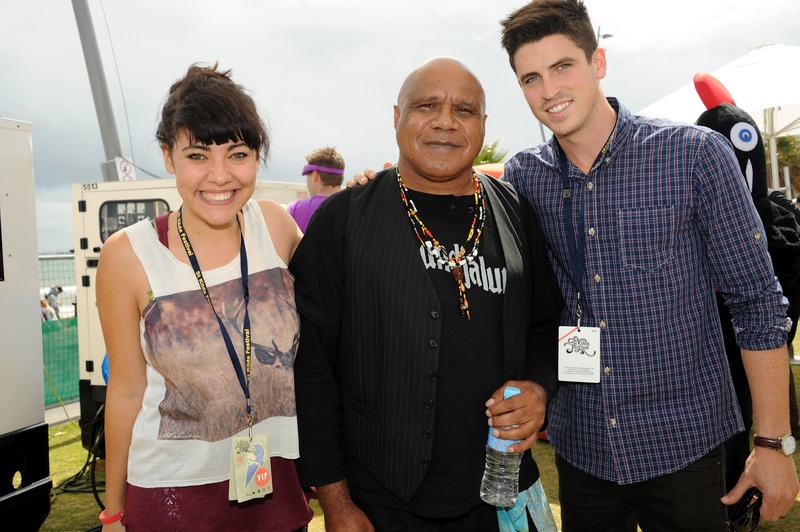 The picture below shows Scott and Ash London, co-host of The Loop backstage at St Kilda Fest, where Scott and Ash hosted the Main Stage. 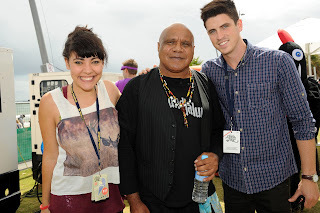 Pictured with Archie Roach.